Christmas Gifts – Retailers’ Rights – ombudsmen not obligatory! It may come as a surprise to some, but retailers also have rights. So, what rights do retailers have when someone wants to return a Christmas present? One of the most popular Christmas presents in 2015 was looking like it would be the Hoverboard also known as the self-balancing scooter. 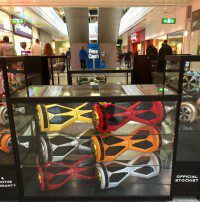 Sadly, however, trade has almost stopped as according to trading standards it is possible that more than 80% of Hoverboards on sale in Britain do not conform to safety standards. In October, London experienced 3 house fires in just 10 days each caused by faulty Hoverboards. It was found that these products did not have a fuse located in the plug to cut the power supply after a power surge and that they continued to charge the product when it was already fully charged! What do retailers need to do about this or anything else that is faulty? From a legal standpoint you will need to issue a refund to customers who have bought faulty items. Retailers need to issue a product recall if there is any risk of injury to customers. Following the new Consumer Rights Act, introduced in October, the customer has the right to return most items, including digital purchases. If the item in question isn’t of satisfactory quality, fit for the purpose intended or as described then the customer could be entitled to a full refund up to 30 days after purchase, but this applies to the purchaser of the gift rather than the recipient. You can ask the customer to produce evidence of purchase, such as a gift receipt. By the time many Christmas presents have been received it’s already past the 30-day limit for the customer to claim a refund. However, they may still ask the company to repair or replace a faulty item within 6 months of purchase. If the customer discovers the fault within the first six months from delivery, it is presumed to have been there from the time of delivery – unless the retailer can prove otherwise. If the customer is still unhappy with how you have handled their request, you should refer them to your official complaints process. If you reject their complaint then you have to provide them with details of a certified ADR provider, like ProMediate, which is a low cost and simple alternative to a small claims court – to will review both sides of the case and to try to agree a resolution. This may include replacement of the product, an apology and sometimes a financial payment. However you DO NOT HAVE to use the ADR provider that you put forward and you do NOT HAVE TO USE AN OMBUDSMAN! The risk is that if you don’t use ADR the customer can go to Court and this can cost. If you have a problem with a customer this Christmas and you aren’t sure what to do, you can visit the consumer section of our website, Click2Resolve, which will provide you with advice for responding to the complaint and using mediation as a cost effective way of resolving the situation.